FILE - Ghana President-elect Nana Akufo-Addo smiles at supporters in Accra, Ghana, Dec. 9, 2016. Education at the secondary high school level is now free in Ghana. President Nana Akufo-Addo announced the launch of the program Tuesday, calling it a necessary investment in the nation's future workforce. The response was enthusiastic, with parents and students forming long lines at public schools around Accra this week to register before classes open September 18. The West Africa Secondary School expects to admit close to 700 new students this year. Freshman Charity Oduro was excited that she now has a chance to study business. "My parents don't have money so, yes, I'm going for free education," she said while standing in line to sign up. Ghana introduced free compulsory education at the primary and junior high school levels in 1995 as required by the constitution, but implementation took time. It wasn't until 2014 that the World Bank said Ghana had achieved near-universal access at the primary level. Extending that policy to SHS, or secondary high school, was a major campaign promise of Akufo-Addo. "The countries that have made rapid progress around the world put education at the heart of their development," he said. "Our economy for over a century has been depending largely on the production and export of raw materials. This cannot and will not create prosperity for the masses of Ghanaians." Ghana will spend an estimated $100 million [400 million cedis] for the new program in its first year. The government expects the annual cost to go down in subsequent years. Students will pay nothing. The government will cover tuition, textbooks, meals, school uniforms and other expenses. The goal is to increase enrollment and cut the dropout rate. 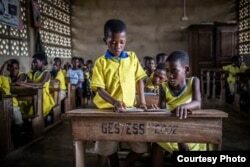 Ghana's education ministry says it found that as many as 100,000 students pass the Basic Education Certificate Examination each year, then drop out of high school because their families can't afford it. "Oh, it helps us plenty because if you bring your child for the school like this, you pay money. Now, when we came, they didn't collect something from our hand," said Libaba Mohammed, who enrolled her daughter this week. But not everyone is pleased. Private schools say their enrollment will suffer. "What is to happen to 10,000-plus Ghanaian workers who are currently employed in our schools?" said Joseph Dzamesi of the Conference of Heads of Private Second Cycle Schools. "What is government's plan to provide a platform that gives our schools a realistic chance to thrive? We, therefore, call on government to, as a matter of urgency, to include private SHS among the schools listed on the self-placement website. Secondly, we call on government to extend its policy of free SHS to cover students in private senior high schools also." Ghana's education minister, Matthew Opoku Prempeh, refutes fears that private schools will be hurt. "We've had free compulsory universal basic education for over 10 years now, making basic schools free, but the most thriving sector within the basic schools are the private," he said. "We as a government in power don't want to kick out the private sector. Our intent is to provide quality education, remove financial burden for parents who can't [pay] in the public space. Some students choose to go to private schools. The records are there. So [private schools] should be looking within themselves, looking at the space, charting a niche for themselves and offering competitive services." Ghana's move to a free SHS system also has sparked concerns that schools won’t be ready for the large influx of new students this year, which will lead to congestion and a drop in the quality of education. The education minister said the government based its calculations on data from headmasters and on the total number of students who passed the entrance exam. "We should be able to place everybody," Prempeh said. The government has pledged to carry on with a separate, $156 million project that began in 2014 with funding from the World Bank to improve learning outcomes for secondary high school students.